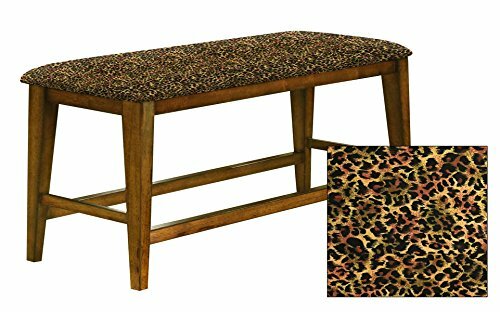 Customize the look you want on this all-purpose bench that features a padded seat cushion covered in your favorite animal print fabric. This bench not only shows off a fun animal print, it's also constructed using a classic tongue and groove joint construction for sturdiness. The added benefit of having the option of a counter height bench allows for flexibility of using the bench in a kitchen nook, game room, entry way, man cave, or just about anywhere you need to add extra seating. We also offer this same bench in the standard bench height of approximately 16 ½" tall. Assembly required. Dimensions are approximately 48" long x 25" tall x 16" deep.